A remarkably innovative upgrade on tradition, this next-generation oxford seamlessly integrates craftsmanship with features that rival top-of-the-line running shoes. Integrated Motion Outsole and Flex Welt support unrestricted movement and flexibility. The knit upper of this style tends to have more give than our other styles; as a result, we suggest ordering a ½ size down from your normal size. Nice shoe. Problem is the fit is tight and uncomfortable in the mid area of the foot. This is probably my 10th pair from Cole haan. This pair is tight and not too comfortable. Nice and stylish though. I love the 2.ZeroGrand shoes! I own a quiver of them. I've bought these in all 3 colors. They take up nearly ZeroSpace in my luggage since they compress. Great for summer months since they are so breathable. A bit chilly if you are walking urban environments in the winter. They feel like wearing athletic shoes and you can even wear them to the gym if you don't want to carry an extra pair of tennis shoes for working out in your travels. Order a smaller size, you’ll love them. Love these shoes, but they’re too big. I own lots of Cole Haan shoes, but these are about 1 full size too long in the length. Light, flexible, good looking. My doctor just complimented me on them and took down the name so she can look them up for herself. These shoes look great, they are very breathable, versatile and for the most part comfortable. They were a little tight around the leather saddle part, but I think that will become more form fitting as I break them in. It feels like my heel is right in the back as well as over the bottom of the shoes but it could also be made to fit that way, just have to get used to it. I wear Cole Haan regularly but these shoes kill my feet. Not happy with this pair. Unbelievably comfortable shoes - the best!! Love the shoes. Have worn them with semi formal and casual clothes and works well. Like waking on a gel floor. Love them. Love that one can put them on without messing with laces. I have both the black and gray. Nice looking shoes but has no support for long wearing. Great shoes as usual, you can not get wrong with Cole Haan. I like this shoe. is very confortable to use any day of the week, is made with very good quality. Very well made and would buy again. Frankly this is the most versatile and style pair of shoes I have ever owned. I will most defeintly buy additional pairs going forward. Worst experience ever! I love Cole Haan for dress shoes but will never buy other than dress shoes. Nice , comfortable shoes. Lighter then many sneakers! These shoes are very comfortable. Very comfortable lightweight shoe. They run a little narrow. But great feel. Gotten a lot of compliments on how they look and only had them for a day. This is my third pair of zerogrands. When I'm looking for style and comfort in my closet, these are the first ones I grab. Running shoe comfort with dress-up style. What can be better than that? Great quality as expected from Cole Haan. Very light and comfortable. Like the modern style. Amazing shoe ! More comfortable than what I thought they were going to be. Very light weight, very stylish, great shoe. So pleased with my purchase, I ordered them in a different color ! Going pink, Cole Hann style ! I'm on my feet all day and this is truly one of the most comfortable pair of shoes I've ever owned. I have 30-40 pairs of Cole Haan shoes and I am always a 10.5 but for me these fit more like an 11 unless I have them tied very tight. Easily the most comfortable shoe I have ever worn. I find the earlier reviews very helpful. First I thought to get 11.5 as I have had issues with size 11.0 in some other brands, but after reading reviews I hung on to size 11.0 and it was correct decision. Would Love to own a pair of these great shoes in a size 15. I squeeze my size 15 foot into them and they are very uncomfortable and don't look as good. Best shoes I have bought in a long time. These are the best shoes I have bought in a long time. Great for work especially if you are on your feet a lot or walking around. I could wear these all day. High quality hybrid leather and knit upper build. Knit material looks fantasic and they are comfortable. Perhaps the most comfortable pair of shoes I have ever owned?! Love this shoe. Comfortable and stylish both at the same time. Just like sneakers but the look of a dress shoe. New college grad wanted to wear for his business casual job. Needed a semi-dress shoe, but on the casual side, and one that was going to fit me comfortably. For ease of packing, light weight and CH Brand. 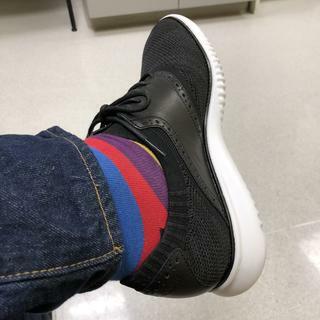 I have several shoes from Cole Haan and they are very comfortable so when I saw they have this pair of "packable" shoes it was an easy decision to get a pair. Love the black knit and overall quality of Cole Haan shoes. I am an advanced practice provider who spends most days on my feet seeing patients. I also live an active lifestyle and routinely toss clothes and shoes in a backpack. I need something that looks good, packs well, and wears comfortably. I like the oxford and sneaker combination. Liked the look of the Saddle Knit and a sub $100 Cole Haan was hard to pass up. Easy going sneaker for casual and casual smart. Light and packable, price was right as well. Lightweight work shoe for working events on the road! Super Stylish!!! I have the same shoe in a different color. It is the most comfortable shoe I’ve ever owned, and it looks really sharp. because I have 3 pairs already and they are so comfortable and east to get on and off. Best price and comfort to go with it! 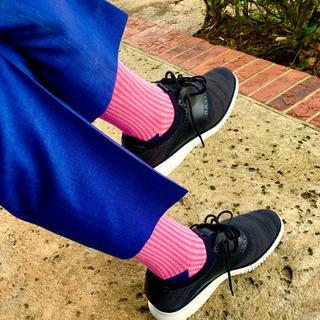 The style and comfort, quality of the craftsmanship is what always draws me to my favorite shoemake, Cole-Haan. Wearing these to my upcoming family reunion. I needed a black shoe that's casual enough for drinks but also works for a semi-formal work environment. It is a pack-able shoe that also looks good. Really good comfort and style!!! Is the bag included with the shoes? BEST ANSWER: Yes. This style comes with the shoe bag. Would this show pass as a dress shoe for night clubs? BEST ANSWER: No, I do not think so. In my opinion a dress shoe's must is leather. This shoe has its advantages in the relatively small packing size. With nice black jeans and a casual look it would go great! Probably not in NY but Chicago, LA, I think so. This is a casual shoe, not a dress shoe. does his shoe have stitchlite? BEST ANSWER: The material of this shoe is similar to Stitchlite, but it is more tightly-woven than Stitchlite and does not have an interwoven design. Yes. It has some leather, but is predominantly stitchlite. What is the best way to clean the shoe if soiled? BEST ANSWER: I would not recommend any acidic based products on ANY shoe if you are looking for longevity and it is not worth the risk of getting clorox or any other product on upper of the shoe for fading reasons. Ive been told that the Cole Haan cleaner they sell works well, but I personally use a sneaker cleaning brand called Reshovn8er, though im sure a magic eraser would work well to. Can you make in off white sole? BEST ANSWER: Not sure about color. These are great shoes. Very versatile. They can be dressd up or dressed down and very comfortable. I really think the white soles sharpen the look and you would be disappointed with off color. Are they light weight ? BEST ANSWER: The weight will vary slightly by size. For example, size 8, one shoe weighs approximately .80 pounds. Will you be making this in Wide sizes? BEST ANSWER: This particular 2.ZeroGrand is available in Medium widths only. To see our selection of extended width shoes, please click on the Width tab on the mens shoe page.